Construction has begun on opening up one of our remaining three major trail obstructions along the canal. Contractors have begun work at the site known as the Conrail embankment, located 1 mile south of Bridge Street in Morrisville. The towpath on both north and south sides of the embankment will be closed due to this construction for the foreseeable future, as contractors prepare to tunnel through the embankment. Once completed, towpath users will once again be able to safely traverse through this segment of the canal towpath for the first time in decades. 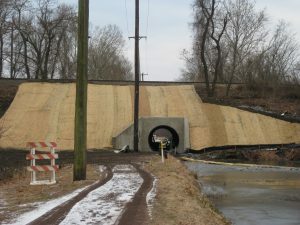 This summer, Delaware Canal State Park put out a bid for a contract to install a pedestrian tunnel through the embankment in Morrisville where a Conrail railroad was built over top of the canal and towpath, effectively creating a dead end on the towpath. This project will resolve one of the last three remaining obstructions to the towpath and will allow users to continue safely through Morrisville and Falls Township. A contractor was awarded the bid and will begin construction sometime this fall. As part of the construction of the pedestrian tunnel, it will be necessary for the contractor to install a temporary crossing and pipe on the south side of the embankment. In order to install this, the canal needs to be drained. Due to restrictions surrounding the red-belly turtle, a drawdown of water in the canal must be completed by October 1 to minimize any impact to the turtles. Effective immediately, the park will begin the drawdown from Morrisville south in order to be complete by October 1. Water will be released from the waste gate near Maple Ave. in Morrisville. Water flow will be reinstated once the contractor is completed with all necessary work in the canal. During the drawdown period, park staff will once again be monitoring the dewatered stretches for fish in need of rescue. The park appreciates the help of neighbors and visitors, and welcomes notification of locations where fish are in need of rescue. Please contact the park office at 610-982-5560 with any questions or comments.